Training videos are an efficient and cost-effective alternative to traditional training methods. Let us help produce a video which will serve geographically diverse audiences and ensure each of your employees receive the same clear and concise message. What better way to promote your business or organization than through video? A professionally produced video for your website can be an efficient and effective way to reach prospective clients and customers. Or give them a promotional "CD Business Card” and let the video tell your story. Need a more effective business card? Consider a business card CD that can talk to your client, and show him/her your product or service in action. Rapidly gaining in popularity, these ‘videos’ can be played on virtually any personal computer. In addition, they can provide your client (or prospective client) a direct link to your company website and/or email. Consider the competitive edge a business card CD will give you over your competition! You have an idea, a story to tell, but not sure how to get it started? Call us for a free telephone consultation. Let Riverside Media, Inc. take you and your project from concept to distribution. Considering advertising your business on local television? It's a great way to generate new customers and sales! If a picture says a thousand words, then a thirty second commercial shows thousands of pictures at thirty frames a second. Television visually conveys your product or service, enhances your public image and is the most powerful form of communication with prospective customers. Your target audience is accustomed to getting information from high-quality, visual communications channels. Riverside Media, Inc. meets that challenge by using advanced techniques and state of the art digital equipment to get your company’s information out in style. When your next business event is planned, consider documenting it digitally. We have years of experience in capturing events using one or multiple cameras, and with high quality audio capture capability. Additionally, we can provide a verbatim, written transcript of virtually any proceeding, or closed-captioning for the hearing impaired. If your needs call for still photography, we can help. With more than thirty years of professional photography experience, Riverside Media photographers have produced tens of thousands of images covering a wide range of subject areas. Projects have included construction photos, evidence photos, product photos, executive portraiture, special events, photos for publication, close-ups, etc. In addition, we have mastered the use of state-of-the-art software and techniques to produce the results you need. Digital, non-linear editing is the current state-of-the-art in today's production environment. Riverside Media has three digital editing suites, complete with stock footage, an extensive music library, and years of experience in their use. By shooting, editing and mastering digitally, we can produce the highest quality results available. 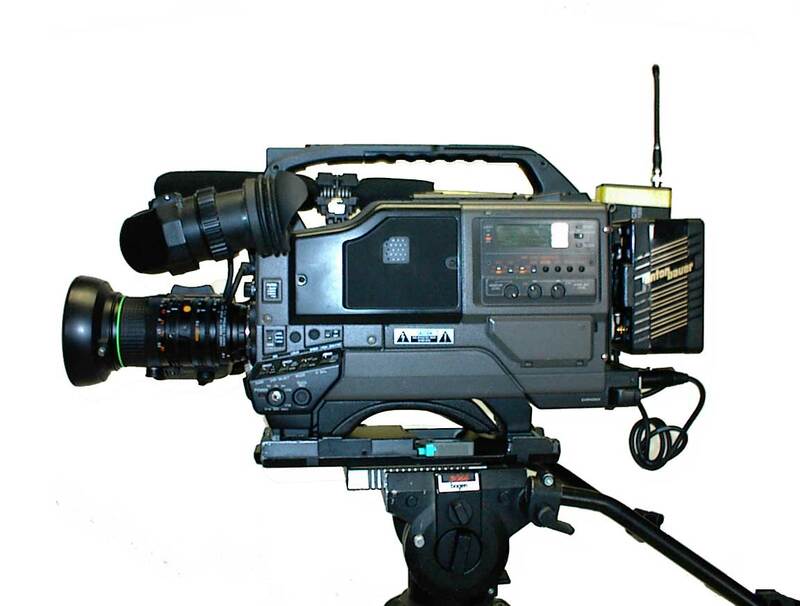 From basic editing to advanced compositing and animation, we can assist you in all your video communications projects. Share your next event with those unable to be physically present, whether your audience includes several people around the corner, or thousands of people scattered around the world. 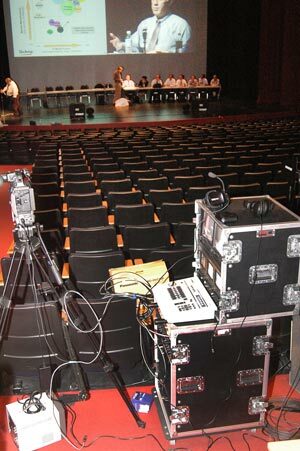 Riverside Media has webcast numerous live events for worldwide audiences. Contact us to discuss your next event. 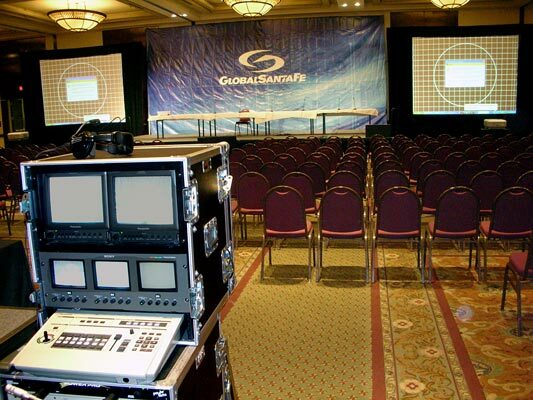 From a single mic and podium to multiple synchronized hi-resolution LCD projector/screen setups, let our team of AV professionals help make your next corporate event a success.